Naver’s subsidiary Line is to introduce membership programs for participants in the blockchain ecosystem based on LINK, its general-purpose coin. 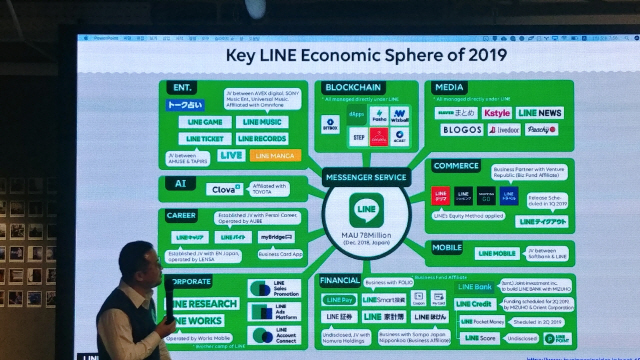 In a Line meet-up held in southern Seoul Wednesday, Lee Hee-woo, CEO of Unblock, Line’s blockchain subsidiary, said his company would adopt pioneer membership programs for first movers who entered the Line ecosystem first. The loyalty programs include providing LINK users with benefits like purchases of goods of limited edition and reception of private newsletters to boost communication with them. Currently, LINK is traded exclusively via Bitbox, Line’s cryptocurrency exchange. LINK tokens began to be distributed Sept. 4 last year and 4,365,843 tokens, or 4.36% of the total, were traded as of Jan. 31. The membership programs are divided into two broadly: a prestige club for ordinary token holders and an industry club for institutional investors including venture capitalists. The prestige club is dedicated to 100 or so token holders having 5,000 LINK or more. Various benefits will be offered to inform them of LINK and the club will remain valid for six months. The selected people will receive 10% of LINK they retain in the relevant period via Bitcoin (BTC). Ten or so institutional investors are expected to be chosen. Those chosen will get 20% of their LINK tokens via BTC and have priority in being Line’s partners. Applications for this program will be possible from Feb. 25 through March 31, with reputation and influence being the crucial factors. “This year will be the first year the LINK ecosystem expands remarkably. We will set up a popular alliance by attracting a variety of projects from the outside,” said Kim Woo-suk who is leading the LINK tokenization team. LINK is run on five decentralized applications (DApps) now. They are quiz service 4CAST, question and answer service Wizball, product review service Pasha, food review service Conomi and location service STEP. LINK is usually utilized mostly in DApps and Line plans to make forays into such services as commerce, social media and games this year. Line is most active in four Asian countries: Japan, Taiwan, Thailand and Indonesia. Its monthly active users (MAU) in these countries number 165 million. No doubt, Line’s huge user base is the source of the LINK-based blockchain platform.